The Santa Monica Pier Aquarium is situated on the world renowned Santa Monica Pier. 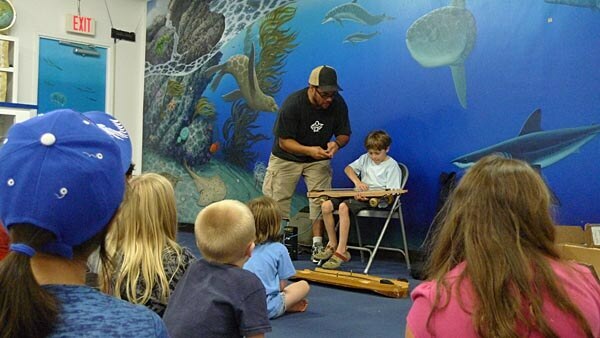 Owned and managed by Heal the Bay, a non profit organisation and member of the EarthShare California group, the Aquarium is committed to safe-guarding the Bay’s future with a wealth of public marine-education activities. This attraction is suitable for the whole family and also plays host to a great many field trips from local schools. The Aquarium is unique in that all the species of marine animals and plants housed within it, and there are in excess of 100, can actually be found residing in Santa Monica Bay. Offering an unequalled insight into life in the Bay, the center plays host to more than 85,000 visitors each and every year. Special events are regularly held at the Aquarium and include “Whale of a Weekend”, a celebration of the grey whales annual migratory journey, “Earth Month Celebration”, held each April in conjunction with the global Earth Day, and not forgetting Halloween when the Aquarium staff and volunteers dress up in marine themed costumes and the center showcases animals that glow in the dark! The Aquarium is open to the public Tuesday through to Sunday usually between 2.00and 6.00pm, but slightly longer at the weekends when the center opens at 12.30pm. Entry costs a minimum of $3 with a suggested donation of $5; children under the age of 12 go free. Overall, the Santa Monica Pier Aquarium is well worthy of a visit and is sure to delight visitors young and old. It plays a significant part in ensuring the longevity of the Bay area and encourages young people to get involved in its conservation from an early age. Last updated by Linda Forshaw on 29 December, 2011 in Destinations.